Cabo Auto Rentals is a full service renting company that helps connect our customers & clients to some of the best vehicles, boats, limo/shuttle services & related by matching them with the cheapest prices (DEALS) available in Los Cabos. If you don't see what you need, we'll get you want you want, just ask. We offer the most complete and insured services in the area. We want to be your complete concierge service, essentially in Los Cabos. Your 1 stop shopping. Click on photo to left for video. Enjoy my new 43', $500k yacht for as low as ONLY $595. 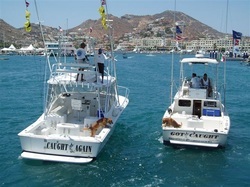 2 Charter boats of the many we have available for fishing & other small private cruises. These are 31' Bertram & 32' Luhrs. We have up to 100' boats available. Please contact us for more details. Limousine & private car shuttle services from / to airport and any other need. Late models: Red hummer, white Suburban and Escalades. Options do change for these limos.